Android System is a mobile open-source operating system (OS), developed by Google, utilized by a large community of users from around the globe . Due to its free and vast ecosystem, users with good intentions as well as criminals have taken advantage of the OS, unfortunately, implementing malicious attacks on many of Android’s vulnerable applications . Because of security risks and exposures facing Android OS, the primary concern has been exploring methods that enable Android to remain open-source and sustain a high level of security. As a result, this research investigates the recent vulnerabilities and security risks of Android System, in addition, utilizes one of vulnerabilities explored (CVE-2014-3500) to design and conduct an attack via application on Android mobile device. Essentially, this study will produce familiarity with how Android System security is approached and operated to keep the operating system secure for its users. The focus of this project is to explore learning algorithms for automatically detecting layer boundaries from images collected from the Polar Regions, specifically Antarctica images. . Layer boundaries are incorporated into climate models for forecasting a rise in sea level but are difficult to extract from noisy images. Currently, glaciologists manually identify layer boundaries, which is time-consuming and requires sparse hand selection. An active contours model will be explored for detecting layer boundaries. An active contours model (snake) is used in computer vision for object tracking, shape recognition, segmentation, and edge detection. The snake algorithm is an energy optimization spline guided by an outside constraint force and influenced by image forces, which would pull it toward layer boundaries. We describe the application of a statistical technique kenned as Multidimensional Scaling to analyze & model a stock market. 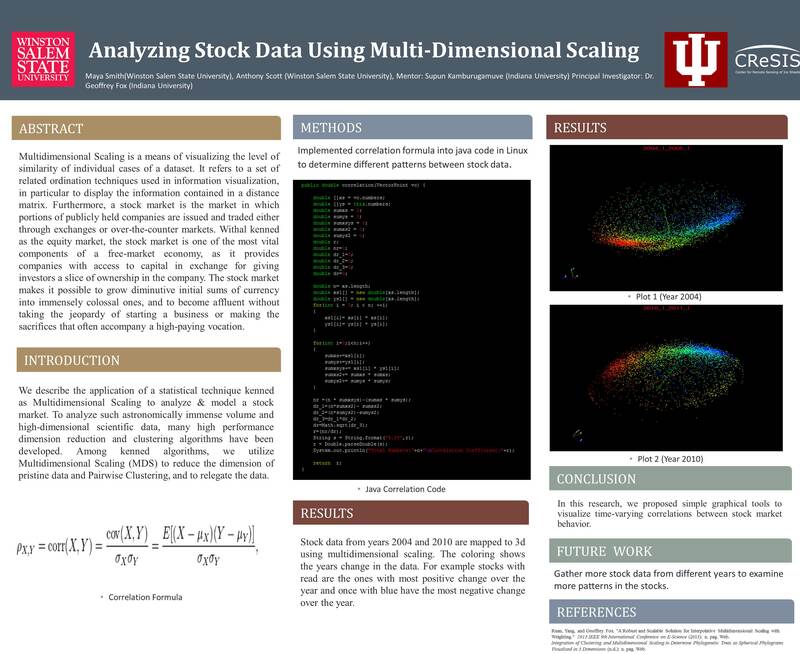 To analyze such astronomically immense volume and high-dimensional scientific data, many high performance dimension reduction and clustering algorithms have been developed. Among kenned algorithms, we utilize Multidimensional Scaling (MDS) to reduce the dimension of pristine data and Pairwise Clustering, and to relegate the data. Multidimensional Scaling is a means of visualizing the level of similarity of individual cases of a dataset. It refers to a set of related ordination techniques used in information visualization, in particular to display the information contained in a distance matrix. Furthermore, a stock market is the market in which portions of publicly held companies are issued and traded either through exchanges or over-the-counter markets. Withal kenned as the equity market, the stock market is one of the most vital components of a free-market economy, as it provides companies with access to capital in exchange for giving investors a slice of ownership in the company. The stock market makes it possible to grow diminutive initial sums of currency into immensely colossal ones, and to become affluent without taking the jeopardy of starting a business or making the sacrifices that often accompany a high-paying vocation. We have studied a set of innovative papers in this ﬁeld, and report on the current state of the art. The vigor of this approach is in its ease of implementation, effective visualization and dynamic nature. Data was gathered and analyzed from Wharton Research Data Services (WRDS), using it to determine if there was a pattern through correlations. WRDS is the award-winning research platform and business intelligence tool for over 30,000 corporate, academic, government and nonprofit clients at over 375 institutions in 33 countries. We give a brief exordium to Multidimensional Scaling, and verbalize the postulations & quandaries in stock market modeling. The approach developed is modiﬁed to study the time-evolving nature of the markets.